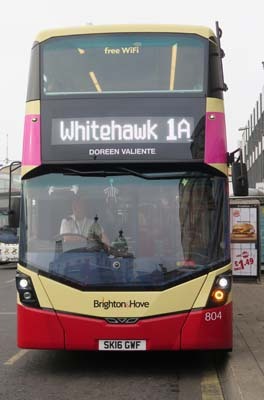 Connections with Brighton and Hove : Doreen Valiente was a pagan witch who lived for many years in the unlikely surroundings of Tyson Place, a tower block of flats, in Brighton. She arrived in Brighton in 1956 when she was already quite well known as what she called a Wiccan. Valiente wrote several books on the subject including an encyclopedia and was regularly interviewed by local and national media. She also made appearances on television. When her husband died in 1972, she was rehoused in a council flat as her damp basement in Lewes Crescent had been condemned.] She made a living by working in a branch of Boots. For a while she joined the right-wing National Front because she was patriotic but eventually decided it was not for her. In 1989 her autobiography called The Rebirth of Witchcraft was published to widespread acclaim and she used it to mark her role in Wiccan history. Her last years were dogged by illness and she died aged 77 in 1999. There was an all-night vigil in the village of Maresfield and after cremation in Brighton, her ashes were scattered in woodland. Valiente’s reputation has grown since her death and there is international interest in her life and work. She has been called the Mother of Modern Witchcraft. There is a blue plaque on her home. 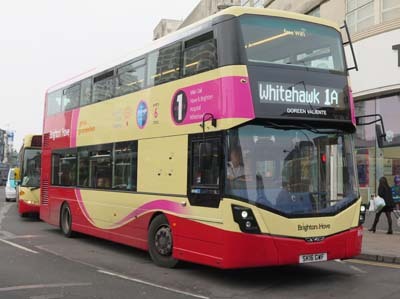 804 Mercedes Streetdeck on Route 1 - carried name since December 2016.